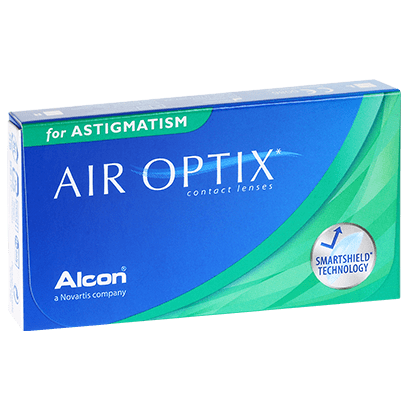 Air Optix for Astigmatism contact lenses have been created by Alcon & Ciba Vision to correct the effects of astigmatism and achieve clear, uninterrupted and stable vision. These toric contact lenses are designed to stay in place when you blink and move your eyes, while providing exceptional comfort and hygiene. These toric contact lenses for astigmatism work to offer a secure fit, with stable vision through their Precision Balance 8|4TM Design technology. By featuring two points of stability, the lenses remain on your eyes during blinking. This helps your lenses maintain amazing visual acuity from morning through till night. These monthly contact lenses also make use of SmartShield Technology to offer a high level of comfort from day 1 to day 30, with a lens surface naturally resistant to dirt and deposits. Eyes will stay moist, refreshed and healthy when you wear these ultra-comfortable toric contact lenses for astigmatism. Air Optix for Astigmatism are ideal silicone hydrogel contact lenses for dry eyes or for those wearers with busy lifestyles. Enjoy relief from the effects on your eyes of late nights, early starts and long hours working when you wear these monthly contact lenses. Suitable to wear for up to 16 hours a day, you’ll enjoy clear, uninterrupted vision all day long with these Air Optix contact lenses. To maintain their high quality, you’ll need to remove Air Optix for Astigmatism nightly, before cleaning and storing them with contact lens solution. We recommend comfi All-in-One Solution for all your contact lens care needs. Biofinity Toric are similar monthly toric contact lenses. Perfect , as always . As usual, easy to order and arrived next day. Very good service. My contacts were delivered 4 days early. Very satisfied! Easy to get in and out, can''t feel them on my eyes (much anyway), and last a longer time than stated if you look after them properly. Don''t skimp when it comes to your eyes though! Not the best lenses for astigmatism in my opinion.. I am constantly aware of the lenses on my eyes and the vision is not as good as other (cheaper) lenses. First class product very comfortable to wear . Your eye doesn’t dry up when going outside into the cold wind after being in a warm room . Normally I found that the other type of lens stuck to the back of my eyelids with these it doesn’t happen . Super fast delivery, came the next day and overall great product !!! Great and clear vision since wearing the contacts. Right eye felt irritated and had to chnage new contact for that eye after a week... but overall great. They just suit me ?? Comfy and easy to put in and take out. Good clear vision,and good for dry eyes. Have used these for a few years now due to their quality and competitive pricing. Brilliant price & fast service! Great! Easy to order, fair price and very easy collection too. Will order again in the future. Never had a problem with any of the services completely hassle-free. Good quality, I have been using this product for 2 years, I never had a problem with it. The best lenses I have ever used, won''t be going anywhere else in the future. Leaves my eyes super dry.. can''t wear them beyond two hours. There are also some numbers and characters engraved on the lens which is irritating. The same as i always used back in Portugal. Very good lenses. I’ve had the odd lens split after a couple of days but they were replaced free on charge. Have tried many makes of my lenses but these are the mist comfortable for me. Many others don''t tend to last a month, but these do. Great lenses. I struggle with comfort in contact lenses and these are the best I''ve ever used. Comfortable all day. The only contact lenses I can get along with. I’ve tried dailies and four other monthly brands but I cannot get them to work for me, they either slide all over the place, rotate ceaselessly off axis or cause my eyes to get super dry. Thank goodness for Air Optix! Extremely comfortable, when compared to others i have worn previously. Excellent quality lenses at reasonable price. These lenses are great value for money, they’re suitable for people who want to wear lenses for long durations and okay to fall asleep in. I believe you can continually wear them for up to 12 days without removing however I haven’t tried this long so couldn’t comment. Worn them for about 3 days continually and they were fine and comfortable after an eye rinse each morning. I have tried most brands if lenses, cheaper and dearer, always go back to these. Clear vision, last a month without clouding and comfortable. 5*. No more lenses sticking to the back of your eyelids from coming out of a warm room into the cold air . Great lenses ?? Love these lenses - really comfortable for hours! Lenses of supreme comfort & quality. I was originally recommended them by my optician for their ability to allow oxygen to permeate through to the eyes. Great contact lens will definitely buy them again. I''ve struggled for years to find the perfect ones and I''ve now found them. Great all day wear and very comfortable to wear. Product is exelent. I love it. Best lenses I have ever used. Much better than daily ones. I''m using this product since one year and I m very happy with them . They are comfortable and very practice. I highly recommend! Amazing and light contact lenses, have been using them for years. Comfortable, easy to put in and remove, didn''t take long to get used to them. Also the moisture is good, I find they need rewetting far less regularly than others and my eyes do not feel dry unless I have accidentally kept them in until late evening. Comfortable all throughout the work day. 10/10 give them a try. Have had no problems with these prescribed lenses - very comfortable and good quality. Fantastic lenses, slept in them& they dont dry out,will be purchasing again!! Fast delivery ..worth every penny ..
Have used these lens for years and they are so comfortable. Been using these for a number of years and though I have not tried others - mainly because of the numbers not being able to be matched in order brands, I''ve never had any issues with these in terms of dryness (I wear them 6:30am - 10pm daily) or vision. Can''t complain ! This is the second product review I am doing on this product. I have had glasses for the past 10 years or so, but never wore them everywhere. I only got them out when at uni lectures/classes or driving lessons. I began a PGCE Science course last year and I suddenly realised how bad my eyesight is. I can''t see the board properly or the students'' faces clearly in the corridors. At my last eye test, my optician told me that I have exactly 10% of a normal person''s vision and that I ought to be wearing my glasses all the time. As an alternative, I decided to try contacts and was fitted with these lenses. I have had two eye infections since, but apart from that, these lenses are never a problem. I wear them all day long and take them out before bed time. Would highly recommend to anyone! So comfortable to wear dawn till dusk. A top class product indeed. Best lenses by far, and have tried many others, which have been too flimsy, too cloudy, not sharp enough or didn''t last a month. Always go back to air optic and will stick with them. Very comfortable. Been using for a number of years and never had any problems. Great, comfy contact lenses with a high breatheabilty rate. Good price and very durable, I wear them for two months rather than one saving even more money. Work well with my eyes. Affordable. Hello! Because I''m an extremely experienced Optometrist, and extremely picky with visual acuity, I was always avoid contact for that reason as I''m astigmatic! 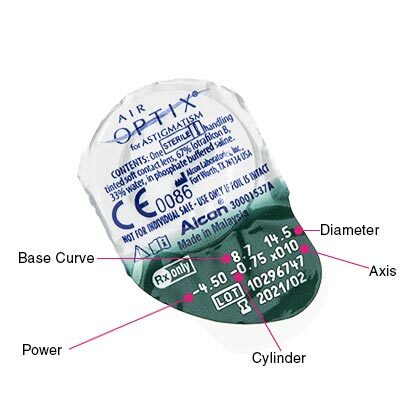 With air optix I''ve been covered to the maximum!! Like I have no refractive error!! The best product ever!! Try it and you''ll definitely come back to my words!! Best lenses, used them for the past 10 years. Confortable and it feels like you have nothing in your eyes. Good product, doesn''t dry out and is fit for purpose. I am a trainee teacher and ever since beginning my PGCE Course this September, I have become acutely aware of my poor eyesight. Not being able to see the board in class, not being able to see signs at the Tube stations-it is very stressful. I do have a pair of glasses, but only used to wear them at lectures/seminars at uni, or whilst driving. At my last eye test, my optician said to me that based on my eye measurements I have 1/10th of a normal person''s vision and I ought to be wearing my glasses all the time. After a few weeks, it occured to me to contact my opticians to try out contact lenses and it happened to be the best decision I ever made. With my contact lenses, my vision is about 20/15!! I also don''t have to be wearing a bulky frame around my face all day. These contact lenses are very good and provide strong clear vision ALL day. I put them in early in the morning before I go out and take them out before I sleep. Would definitely recommend this to anyone. I bought if for my wife. She used to wear normal contacts and couldn''t actually see much wearing them. Now she''s a happy bunny. The only downside is these contacts are more expensive, so you better shop around and buy 6 or 12 months supply to get a better price. Have been using these lenses for years, they are comfortable and tough. Not had any problems with them. Comfortable lenses.....you don''t know you are wearing them ! The goods are of excellent quality especially for the price and innovative. good quality and genuine. Please to have found Feel Good contact lenses. As good as the last lenses I used and at a much better price. Branded contact lenses at a good price. Not a big fan of these cos they would not stay put. These lenses are very comfortable and I have had few problems with them. Very pleased with my purchase-great contacts for a very competitive price. Speedy delivery and a good product. Satisfied all round! No problem so far! And I love the price!